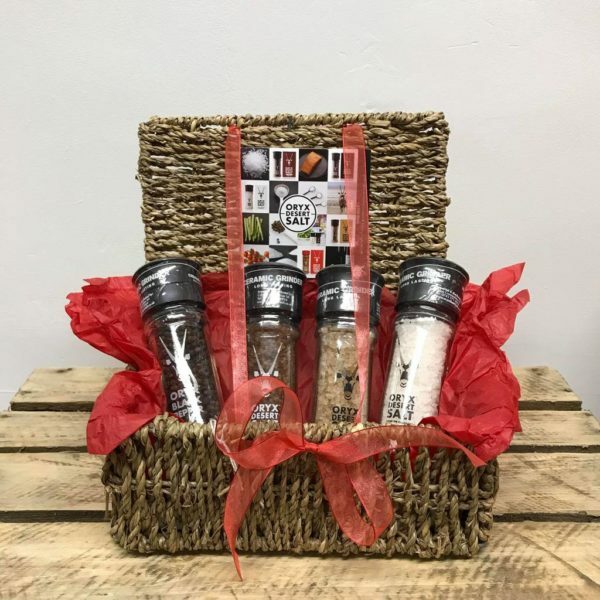 Our Salt Hamper is a must for any foodie. It Is completely as nature intended – no additives, no anti-clumping agents, no preservatives. Dried by the hot African desert sun. Unrefined and unprocessed. The underground brine lake is 100% saturated, so it takes only 4 weeks for the salt to crystallise in the main harvest season in summer when the temperatures reach up to 47o. Each grinder bottle has information printed directly on the glass so they can be kept clean and don’t need to be replaced. These new grinder heads have a ceramic mechanism for long lasting use. So far they have been tested up to 10 refills and they still grind smoothly. You have all 3 flavours and 1 Salt in this Hamper, what more would you need!